Yesterday at Stainless Bar with Success Much, The Vibe Family got to know more about the celebrity. 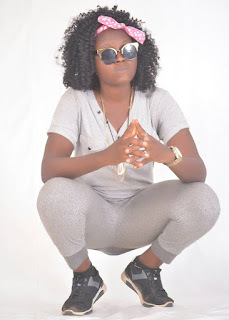 Success Adaeze E. (Success Much) is a Nigerian up and coming Afro/Hip Hop artist. A native of Ezionum, Ukwani LGA, Delta State. It's no doubt she is an Ndokwa Talents and the only female executive member as of present. 1) She admits her choice of dress which is slightly manly, project her different from her female counterparts. Thus, explains why she is a Gucci lover. 2) Other than her date, she rather go out with Korede Bello (an award winning Nigerian recording and performing Artist, undersigned to Marvin Record). Not talking much about this fact but she added that her reason is narrowed down to sharing the same birth month with Korede (February). 3) We also got to know and are happy to on ceremoniously announce that, she is presently working her next video shoot. Comming up May 2018. 4) Not so surprise, she thinks Alhajinip Tekno is more influential in Nigerian show business (showbiz). 5) Not being a big spender yet, She reviewed to us that she rather spend more on her music that clothes and accessories. 6) Yes, she is a bathroom singer. 7) She is presently not working/employed nor into business. 8) She loves her self more that any other persons, parent, friends e.t.c. But, only because she has no kids yet. 9) She believes not in love after but rather at first sight. 11) She has no idea where she would be in 25yrs from now. Claiming, the has not even a clue of tomorrow. Random questions were asked by members of the vibes family there present including Gidnick, Frenzy and Mr Drea. Amongst which was "what brought about the concept of Egwu Oko?". Not withstanding, Miss Much explained that, the songs is a message of focus to young girls, but rather her listeners has failed to listen. She first recorded 2013, about a year after she found intreat in much due to peers. Success Much, however reached to the long propagated rumor about her track (Game Over). She confirmed it was true, that the song has been recorded as a break up song between her and her ex (G3 Boys). "...Even till now we still talk but nothing will bring us back" she said. In conclusion, she added that "being the only female artist in Ndokwa Talents, I am not ready to stop anytime soon". This is The Review Shower (1st Series) with Success Much. Brought to you by The Vibe Family. For Inquires, Sponsorship and Membership, click here. Download featured songs from Success Entertainment Word.